The Valley of the Serchio, in its upperpart, is known as the Garfagnana. It lies between the Apennines and the Apuan Alps (the mountains of Carrara). 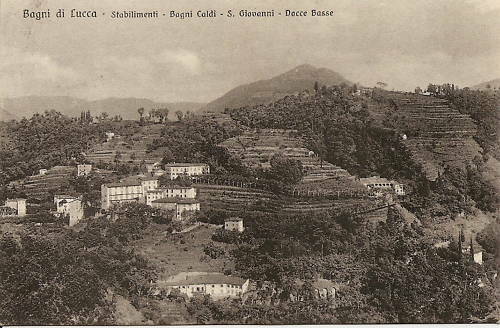 A line of railway already runs up the valley from Lucca for about fifteen miles to Bagni di Lucca, and it is being continued through the Garfagnana to join the line which connects Spezia with Parma at Aulla in the Val di Magra. This district shares with the Garfagnana the distinction of being the finest of the mountainous parts of Tuscany. The forms of the Apuan Alps are of extraordinary grandeur, while the valleys of the Serchio and its largest affluent, the Lima, no less than the numerous clefts through which mountain torrents join the larger rivers, have the picturesqueness and beauty of a northern type which adds piquancy to the southern life abounding on all sides. The lower slopes of the mountains are covered with forests of chestnuts. Against the sky-line villages are outlined on the mountain ridges in what seem almost impracticable places. On the river level there are factories for cotton and paper making. The district everywhere shows signs of active life and general well-being. The most convenient centre for exploring this part of the country is one or other of the villages that together are known as Bagni di Lucca. The station is at the point where the Lima flows into the Serchio. Less than two miles distant is the village of Ponte a Serraglio, and a mile farther on is the village of Villa. 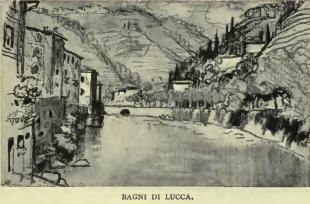 Between these points the river Lima makes a sharp turn round the base of a steep hill upon which stands Bagni Caldi, reached from Ponte a Serraglio by a fine road winding up the face of the hillside, or from Villa by a delightful footpath on the farther side of the same hill. There are baths at each of these places. Bagni Caldi consists mainly of the summer palaces of the Grand Dukes of Tuscany, converted into hotels. The views of the Lima Valley and the surrounding mountains are fine. 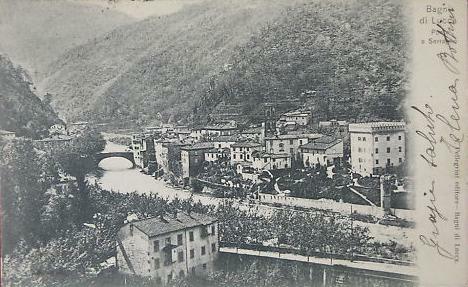 Ponte a Serraglio is situated in a narrow gorge through which the Lima forces its way. The bridge and piazza are picturesque. Villa is the official centre; the valley is more open than at Ponte a Serraglio, and although there are no very distant views the characteristic chestnut forests and the torrent of the Lima give a peculiar charm to the place. The Baths of Lucca has the leafy amenity, the watered roads, the retired villas, obliging tradesmen (very brisk with their gocarts), geramumed gardens, and trim terrace-walks of, let us say, Clapham Park. It cannot escape, however, and does not escape the smug obtuseness of that sanctuary; in fact, it is not the thing for which one travels the mountains of Tuscany. I observed in it a boulevard dedicated – I know not why – to the person and conversation of Mr. Marion Crawford. This is the fact: Viale Marion Crawford. I daresay that he stopped there, and am sure that he was comfortable; but personally I was glad to find out that the sooner you leave the Bagni the sooner you are in the mountains again, and can begin to climb in between them. You have Battifolle in front of you, a towering green cone of 6000 feet. The Lima roars and tumbles about two sides of this monster, and about him go you – to enter the most magnificent gorge anywhere north of Rome. Very narrow it is, and very deep under the crags: there are some five or six miles of it, but the road is excellent. During the summer, and again other summers, Dr. Taylor took ‘sittings’ at the church of England, whose edifice, built in the days of the Grand Duke of Tuscany, was not allowed to have on the outside the appearance of a church, and so seemed to passers-by a large family residence. The morning and afternoon services on Sunday were attended regularly by the family. As for the circulating library (mainly English books), which was delightfully situated in the edge of a villa, it was the joy and blessing of the whole family through all their years at the Bagni di Lucca. The Casino was not much used by the Taylors, but the Sunday afternoon concerts in the village square they had to hear nolens volens, as their house was only a stone’s throw away. Since their landlady was a Catholic, and also their cook Ottavia, Mrs. Taylor did not like to leave the baby too long alone without any member of the family, for she had read a story about an English mother who years before had lived at the Bagni di Lucca. It was to this effect: she went away once to be gone all day, leaving the baby with the Catholic nurse. Returning for some reason sooner than she had planned, as she entered the room, she heard the servant say: ‘Another cursed Protestant out of the way’. She had poisoned the baby. If anything, Bagni di Lucca was more delightful as the early autumn days came on than in the summer. Then the chestnuts began to open and fall. As the people used the chestnuts for flour, the trees were closely watched as the fruit came to maturity. Up the mountain-sides there were bridle-paths, not roads, and any chestnuts found on these paths might be picked up freely by anyone, but to step out of the path and pick up chestnuts was to trespass, and there were those on watch to prevent such infringement of the law. When the chestnuts have been gathered and dried, they are ground at the mill and the flour made into cakes and baked between heated stones, covered by leaves. More than once the family lingered at the Bagni in the fall, after Dr. Taylor had gone on to Rome. It was safer in Rome after the equinoctial fall rains. By that time it would get too cool without fires, and the Casa Morgana at the Bagni had no fireplaces nor stoves. Then Mrs. Taylor would gather her little ‘brood’ and, with Ottavia and her daughter Libera, cook and nurse respectively, hasten on to Rome. One year, upon their arrival at Pisa, it was learned that the rains had broken the line by Civita Vecchia, and that a detour by way of Florence would have to be made. But this route was much more expensive, and there was not enough money for the tickets! What was to be done? Fortunately, the Episcopal pastor at Pisa was the summer pastor at Bagni, and he kindly loaned Mrs. Taylor the necessary money.